Whether you want to break into the news industry, create compelling social media content, make documentary films, or run your own public relations firm, Pace University’s MA in Media and Communication Arts will help you further your career in communications. Our program offers advanced professional training in videography, editing, media writing, public relations, production, and advertising; teaches students how to apply new technology in the workplace; and provides the practical work experience you need to succeed from day one. 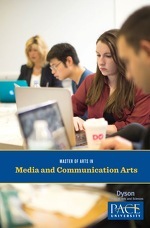 The goal for the MA in Communication and Media Arts degree program is to further prepare students for careers in the communications industry which presuppose mastery of the written and spoken word, as well as of the ability to apply new technology in the workplace by offering advanced professional training in videography, editing, media writing, public relations, producing and advertising. The program includes 16 hours of required courses and 20 hours of elective courses. A comprehensive exam is required upon completion of the program. Students will use Pace University’s state-of-the-art Communications Center for script writing, video shooting, editing, audio sweetening and production. The result of these experiences and completion of practica and case studies will prepare outstanding professionals to secure employment in a wide range of positions.